Drawn from the disciplines of cartography, archaeology and design, The Museum Within concerns itself with the position and function of the ‘museum’, elucidated specifically in the selection and cataloguing of objects for display as well as its role in conservation. 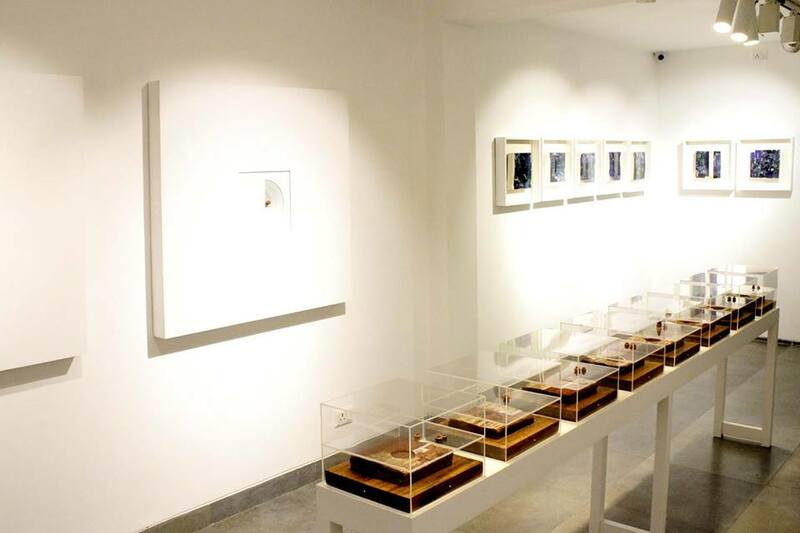 Donning the mantles of archaeologist, museum curator and conservator, Debasish Mukherjee reimagines these roles and reconstructs architectures and objects from his past in order to raise questions around preservation and neglect. 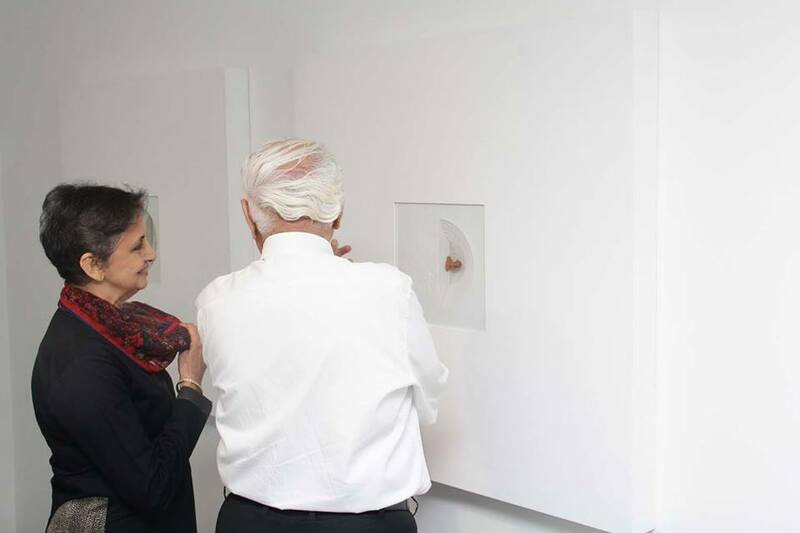 The Museum Within proposes alternative forms of inquiry into the keeping of Indian heritage. 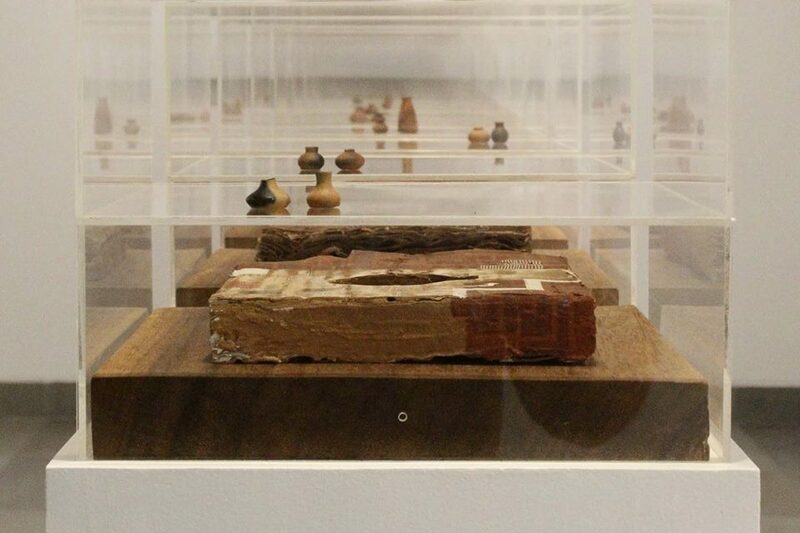 Do Indian museums aptly serve as custodians of material culture and collective identity? Do our historical sites deserve more respect as emblems of social history? How can we communicate our centuries old traditions better, so as not to lose them completely? Rooted to the land of his birth, Mukherjee recognized that he was artistically inclined at a young age. Having rejected middle class India's formulaic career options, Mukherjee applied to art school in order to pursue his passion. He graduated with a degree in Fine Arts from Banaras Hindu University in 1994, and an opportunity he couldn’t turn down led him into a world of fashion and design. He has not looked back since. A keen observer, almost always with a sketchbook in hand, Mukherjee documents all that moves him. Unlike an archaeologist who excavates physical space looking for clues that inform our understanding of civilizations, Debasish Mukherjee employs the archaeologist’s quest as a means of resisting the alleged ‘ruin’ that claim many historical sites today. His work stems from an impulse to create a social awakening so that communities take pride in the architecture that stand as relics of the past - sentinels of aspiration, power, function and grandeur that once was. By visually reproducing his observations through geometrical forms, gorged or exhumed out of a block, revealing a three-dimensional form in negative, the artist unravels a layered understanding of historical sites, be it a Baoli (step-well) or a city like Benares. Before excavation, a site grid is drawn enabling the archaeologist to create a precise map of the site and to record the exact location of all the features and artifacts on the site. Marking a fixed reference point from which all measurements are taken, a rectangular grid is superimposed over the entire site. Each square in the grid is precisely measured and assigned a number. These squares are often referred to as units. Mukherjee’s work follows a similar grid-like plan, with repetitive units recording a series of related finds. This is especially true of his ‘white cube series’, where small objects appear as excavated artifacts, still grounded in the pale surface of their origins. In doing so, Mukherjee adeptly represents a transitory stage between the artifact’s unearthing to its eventual placement for public viewing. Effectively, it also leads one to think of all that is yet to be discovered. The aerial perspective, a tool that has become a pronounced part of visual cultural production (especially since the birth of the airplane), introduces a ‘modern view’, one that unobtrusively observes the ‘larger picture’. Mukherjee, like today’s design conscious cartographer tactfully employs graphic concepts of artistic design, observations about depth perception and the figure-ground relationship, i.e., the visual relationship between foreground and background. The aerial representation therefore, enables a revised interpretation of a site, expressing the more obvious geographical mapping but also proposing an internal mapping of people- those who inhabit these spaces, others who study them, those who remain indifferent, and the artist’s own recordings. Mukherjee’s penchant for spatial design influences the type of form his thoughts are sculpted into. Symmetry punctuates his works and textures are pronounced. Starting each work with a drawn sketch, colour is used as ornament to accentuate an emotive appeal. Each work replicates the way an object or historical ruin, once found, is preserved as collective memory and as museum artifact, as art and as design. From times immemorial the humble clay has remained one of the most popular materials to be shaped by human hands into objects of utility, beauty and spirituality. For Mukherjee, the material signifies living history. Widely used in India, it still makes the brick that holds our shelters up, a variety of household vessels as well as religious idols for ceremonies. The artist’s series of sculpted terracotta pots sit on layers of paper, modeled into square units that appear symbolically aged by the markings of time. 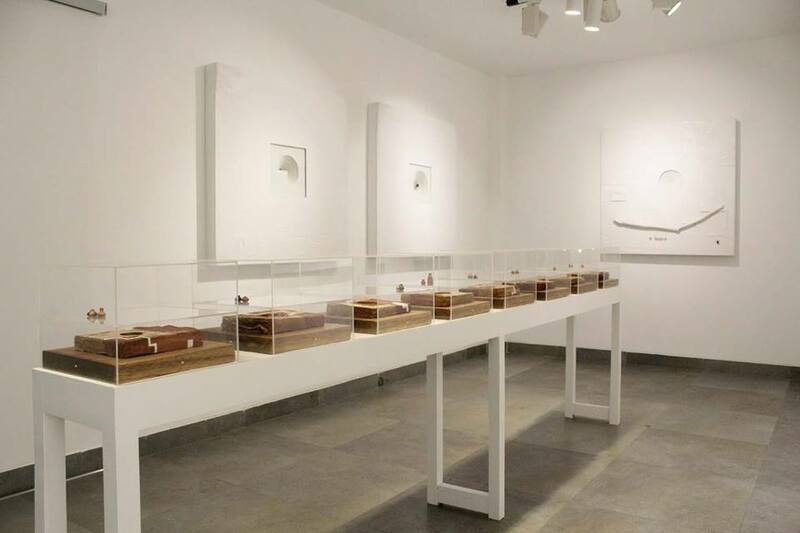 Miniaturized plots of sites, the boxed contents urge circumambulation or a parikrama as though of a sacred shrine, that belongs to a distant past but one that informs our current social and cultural history. One of the exhibition’s most poignant pieces Benares, is based on varying perspectives of the artist’s own experience of the ancient city. 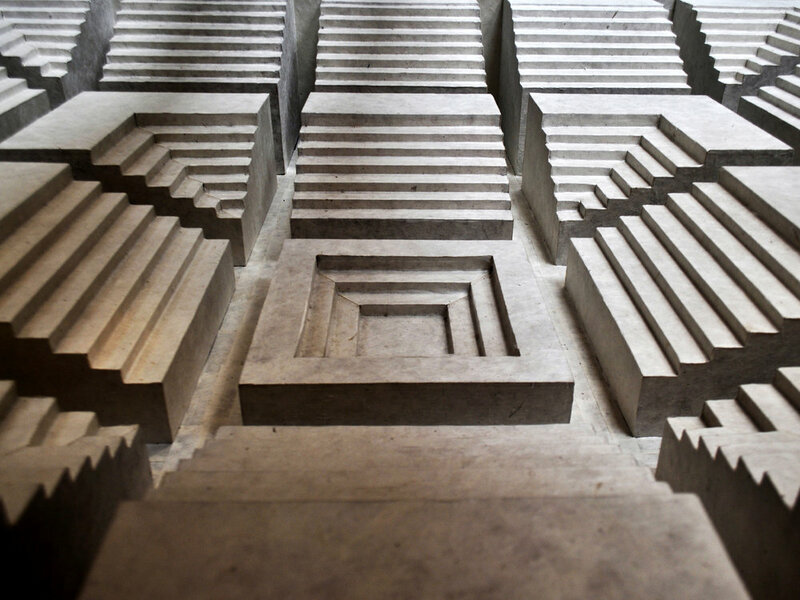 With homes interspersed between narrow lanes that have accommodated generations of growing families, the holy city built along the revered river Ganges is envisioned anew in Mukherjee’s wall sculpture. Twenty sculpted tablets mounted in two rows represent the architecture of the city to which his maternal family belongs and where he formally studied art. It is a city he loves and describes simply as the colour ‘vermilion’- vibrant and dynamic, warm and generous, chaotically beautiful! Mimicking the architecture he sees, is this array of constricted staircases and by-lanes with a temple entrance or a lingam, the cross-section of a step-well, the interior of a home or a glimpse of a ghat, all echoing a quiet energy that defines Mukherjee’s very own Benares. American scholar Diana L. Eck aptly puts it, "The city illumines truth and reveals reality. It does not bring new wonders into the scope of vision, but enables one to see what is already there. Where this eternal light intersects the earth, it is known as Kashi (Benares)". Born in Chapra, a small town in Bihar in 1973, Debasish Mukherjee grew up amidst open spaces and railway colonies, mixing freely with people from a range of social backgrounds. He graduated from the Banaras Hindu University with a specialization in Painting in 1994, and thereafter built a career in fashion spanning two decades. He is a published poet, an avid photographer and experienced designer. Debasish lives and works in Noida.